When I started this home construction project, there were no detailed drystack information websites to be found. Oh sure, there were many sites talking about it, but no one was actually doing it. Quikrete who manufactures QuikWall, a surface bonding product, still has a very limited procedure for laying mortarless blocks. It is obvious that no real guidance for a large project can be gleaned from this QuikWall tutorial. This website was established for people like myself who need dry-stacking detailed information. Text and pictures drive this website. No distracting fancy dancy state of the art gismos will be found here. The information presented here is the result of building two different yet large dry-stacked projects. During the construction phase, copious notes and many pictures were gathered for inclusion into the DryStacked Construction Handbook. We now offer Videos thst supplement the Handbook and demonstrates many topics covered by the Handbook. A 51'x31' work garage and a 2600 square foot house were constructed to ensure that our techniques actually work. Differing techniques were tried during construction, to find the best methods that are published in the book and demonstrated on the Videos. This website will help you to avoid common pitfalls of home construction. Your careful attention to detail will result in a quality home with high resale value. Crooked and wavy walls will result from carelessness and/or misunderstanding of the process steps. The book has been written to provide much detailed guidance. The sequence of these steps of construction are just as important as the accuracy and skills of each step. The skills required for successful dry-stacking are minimal but absolutely necessary for good results. Those required skills are described in the book and demonstrated on the DVD. This website will provide a good overview of the important considerations that can prevent unnecessary and costly mistakes during home construction. It doesn't matter whether you are a owner-builder or you are subcontracting much of the work. 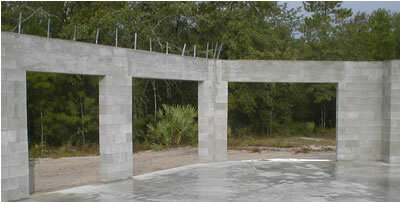 Don't repeat common mistakes while using the most cost effective construction medium available. For very detailed discussions and examples of just how to build in this medium, we have written a book which is titled Drystacked Construction Handbook. It is a one of a kind groundbreaking book with detailed planning and techniques to be used from project beginning to project end. It also explains how to perfect those minimal building skills that are required. 1. Masonry blocks lack perfection. Stacking techniques can prevent error accumulation and ensure plumb and straight walls. Setting proper block spacing is important for square and plumb corners. 2. Floor plan dimensions can reduce the number of cut blocks if the plans are in 1/2 block unit dimensions. 3. Standard old masonry concrete blocks provide for thermal mass, low cost, and a limited number of concrete/rebar filled cells. 4. Surface bonding (SBC) provides base color, waterproofing, superior strength, low maintenance, and requires minimal building skills.